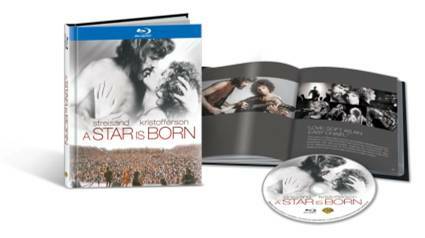 A Star Is Born was originally filmed in 1976, but was released for the first time on Blu-ray on February 5th! It also comes with a 40 page book with rare behind the scene photos of the making of the movie. A Star Is Born combines the fire of Barbra Streisand and the magnetism of Kris Kristofferson one of the screen’s classic love stories. Set in the reckless world of big-time rock ‘n’ roll, this passionate and electrifying tale of talented young singer Esther Hoffman (Streisand) and superstar rocker John Norman Howard (Kristofferson) won five Golden Globe Awards, including Best Picture, Actress and Actor (Comedy or Musical). I expected A Star is Born to be more of a musical. I was pleased it wasn’t though. I would describe it more as a love story with lots of rock music from Kris Kristofferson’s character and more soulful types of songs from Barbra Streisand. I definitely preferred the rock music. I was already a fan of Kris Kristofferson from The Highwaymen. This movie has a lot of great things about it. First of all, the acting is phenomenal. The chemistry between the two main characters was almost palpable. I was immediately drawn into the story because of the way the were together. John and Esther were two polar opposites. He’s wild and doesn’t care or think and she is more conservative in her thoughts and actions. I definitely related to Esther more. I would have been stressed out being around John and how volatile he was. For instance he tells his fans off at a concert and walks off stage. He just doesn’t care. It also brought out my emotional side. I cried at the end of the movie. I can definitely see how this movie won so many awards including ones for best actor and actress. There’s a scene towards the end that is dizzying to watch because you know what is about to happen. Even still hours later, those gut wrenching emotions are still with me. The characters are distinct and memorable. The story was so well-written that by the end of it I felt like I really knew their personalities. It’s always nice when a movie has such rich characters vs. the flat two dimensional characters you forget about five minutes after the movie ends. The only thing I didn’t really like was Barbra Streisand’s music! I know that’s probably weird because she is the star of the movie and is very successful and good at what she does. It’s just not my preference. I’ll have to ask my mom and dad if they have ever seen A Star Is Born before and what they thought if they did see it. Have you seen it? If so, what did you think? You are making me feel old, ask your mom. 🙂 I remember this movie and it was the “Big” movie of the year. I loved the story. It is a movie that I will add to my collection because it’s a classic love story. Thanks for the review. Of my my favorite. I am a big fan of Barbara Streisand. LOL! Reading some of the other comments, I see my sentiments are similar to others. I am a bit older than you, and have seen this movie (along with the 2 previous incarnations of it) more than once. It’s a good story, though not my favourite movie. I also got a kick out of the fact that you only know Kris Kristofferson as one of The Highwaymen. He’s been in many movies, as well as being a singer, song-writer (he wrote Me & Bobby McGee). I was surprised to find that he’s 76 years old – time really does fly. I’ve never seen the movie but would love to..I love Barbara Streisand too! One of my all time favorite movies, Barbara’s song at the end Are You Watching Me Now/Watch Closely Now gives me goose bumps just thinking about it. I can’t wait to get the Blu-Ray version, definitely on my list for my kids to get me.